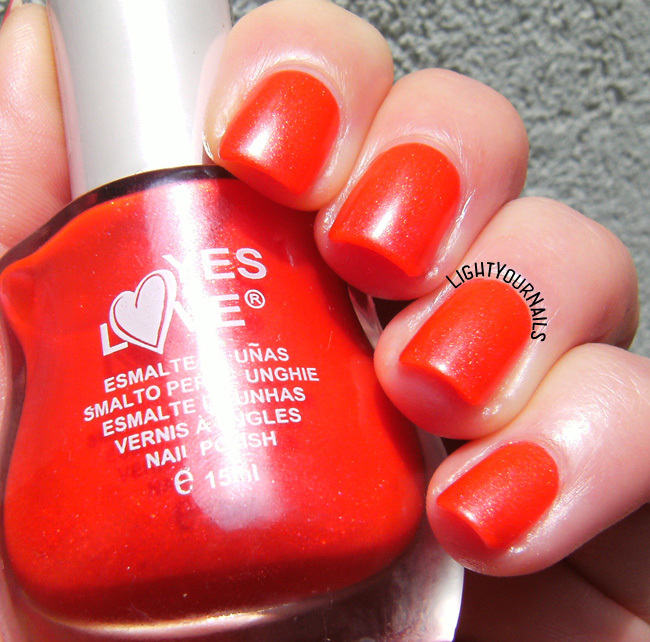 ABC challenge: Yes Love New Matte M07 | Light Your Nails! Siamo quasi alla fine dell'alfabeto, è passato velocemente, vero? Oggi tocca alla lettera Y e ho scelto lo smalto Yes Love M07 della collezione New Matte. Vi ho già parlato del suo fratellino M03 e mi sono trovata esattamente allo stesso modo. La stesura è una favola e non si asciuga troppo velocemente, cosa che a volte accade con smalti matte o semi-matte. In questo caso invece si ha abbastanza tempo da coprire tutta l'unghia ed eventualmente rifinire. Per quanto riguarda il colore Yes Love New Matte M07 è un bel rosso corallo, talmente acceso da essere al limite del neon. Contiene uno shimmer dorato che trovo delizioso ma che risalta solo sotto al sole. La coprenza è ottima, già opaco alla prima passata, con la seconda potete correggere eventuali punti che avete saltato, o semplicemente aggiungere profondità. Sicuramente essendo uno smalto dal finish opaco una passata in più aiuta la durata. We are approaching the end of ABC challenge, it went by fast! Today's letter is Y and I picked Yes Love M07 nail polish from New Matte collection. I've already blogged about its sister M03 and my thoughts are exactly the same. Application is a dream and it doesn't dry too quick, which is sometimes the case with mattes and satins. With Yes Love M07 you have enough time to work around and fill any gaps. 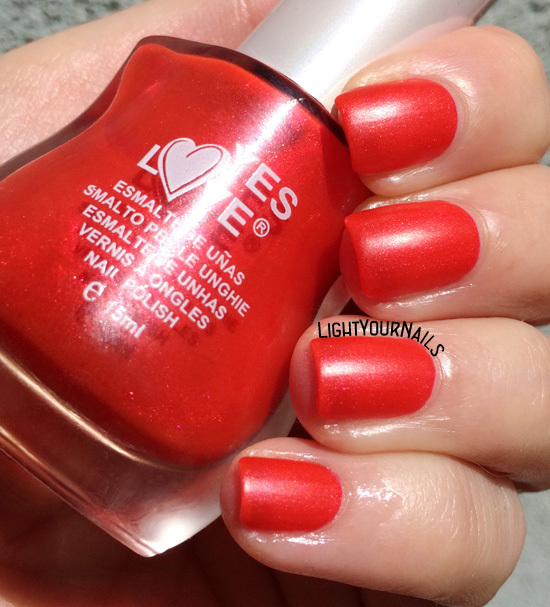 Colour-wise Yes Love New Matte M07 is a bright coral red, almost neon. It has a lovely golden shimmer that only shows in direct sunlight unfortunately. It's very opaque at first coat already, but you can add a second one to fill any mistake, add depth, and help lasting time. Adoro questa collezione Yes Love, purtroppo ho trovato solo un altro di questi smalti, ma davvero meritano. Avete mai provato questo brand? E cosa ne pensate del colore di oggi? Troppo estivo? I love this collection from Yes Love, too bad I've only found three pieces of -I think- 7. They're really worth having. Have you ever heard about this brand? And what do you think about today's colour? Is it too bright for Spring? Thank you! I'm not sure in which countries it's sold honestly. Thank you Helena, and thank YOU for hosting this challenge! Oh, YES, YES I LOVE it :)) Wonderful color, perfect for spring and summer! Credo di non avere nessun neon!! Argh, urge ispezione! I've never heard of this brand, but I think it's a nice shade for this time of year. What a gorgeous colour! I've bought Yes Love polishes on holiday and love them. Thank you! They have so many interesting collections! ne ho un paio super glitterosi, sono tentata ogni volta che li vedo ma sinceramente non so cosa possa esserci dentro! A leggere gli ingredienti non sembra esserci niente di preoccupante, e il fatto che non facciano puzza mi fa pensare che sia vero. I love this color! I like the polish bottle shape, too, it looks like it lends itself well to your hand poses. Congrats on almost being done with the challenge, too! Thank you Stacie! The bottle is quite thin so it definitely helps holding it! I have never heard of this brand and I wish I had heard more. I am a huge lover of reds with a slight orange undertone. It sort of reminds me of coral. I'm going to have to keep my eyes out for destashes. I want to post the heart-eye emoji right here! This polish is so stunning-- love the shimmer, love the matte finish! It's gorgeous! I have never heard of this brand, but that is a nice red! This is so juicy looking! Like a mango or something. LOL! Another gorgeous red... And a one-coater, which is perfect for nail art! So true! And because it doesn't dry too fast it might even work for stamping. Gotta check that! Holy cow this color is incredible! So vibrant. Beautiful on you! Thank you Nichole! I don't know much about it either, I find it in Chinese shops, but it doesn't smell bad as some other brands. Ingredient list looks safe, too.